Enjoy bubble popping (15 minutes) in any one of the arenas. -Glow accessory for each child. 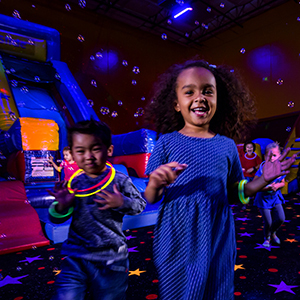 Book your kid's birthday party today and add the Glow feature! We'll snap the shots while you relax and enjoy your kids' party. Magically, you will relive the fun had by all in the party room. Access your photos online to download, share or email with friends and family. 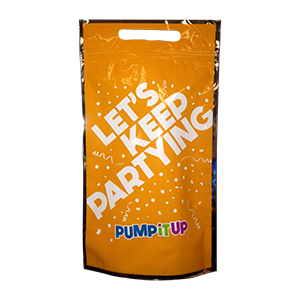 The Pumpjama Party offers the same great features as our popular Classic Party with one twist...you & your friends celebrate in your pajamas! 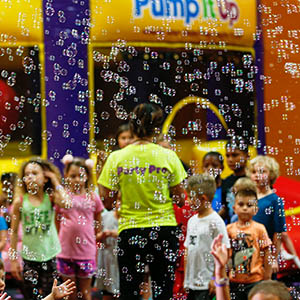 Invite up to 14 friends to join you for this zany experience ($15/extra kid). And that's not all - the lights will be turned off & our GLOW lights turned on in our arena play areas. 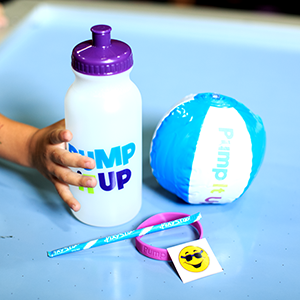 Each child receives a glow necklace plus, Guest of Honor gets a special gift that glows. After 70 minutes of play time, the Pumpjama Party continues in our private party room where you'll find the kids' tables decorated to resemble beds! Arrgh, Matey! 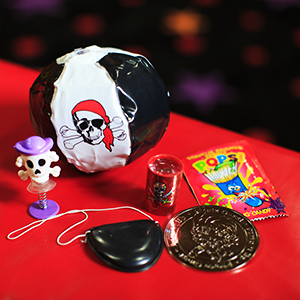 This treat comes with a Mini Beach Ball, Treasure Map, Telescope, an Eye Patch & a Bandana. This treat comes with a Flying Superhero, Stickers, a Boomerang, Superhero Airplane, and much more!